Review by AllTheBestFights.com: 2018-10-20, great fight between Ryota Murata and Rob Brant: it gets three stars. The 2012 Olympic Mw gold medalist and Wba Mw champion Ryota Murata entered this fight with a pro record of 14-1-0 (11 KOs=79%) and he is ranked as the No.9 middleweight in the world (currently the #1 in this division is Saul ‘Canelo’ Alvarez). He lost to Hassan N’Dam N’Jikam in May 2017 (controversial decision, N’Dam vs Ryota Murata I) but then he won the rematch in October (Hassan N’Dam N’Jikam vs Ryota Murata II); after this bout he has beat Emanuele Blandamura in 2018 (Ryota Murata vs Emanuele Blandamura). His opponent, Rob Brant, has an official boxing record of 23-1-0 (16 knockouts) and he entered as the No.44 in the same weight class. He also lost in 2017, against Juergen Braehmer (Juergen Braehmer vs Rob Brant), but he came back to win against Colby Courter in 2018. 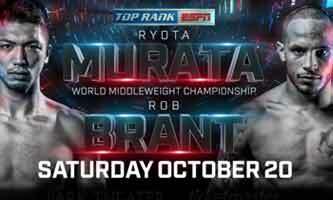 Murata vs Brant is valid for the WBA World middleweight title (Murata’s second defense). Watch the video and rate this fight!